Click here to follow all the build-up to Leipzig's second leg against Marseille! Second season syndrome or the sophomore slump: familiar phrases for the widespread downturn in fortunes for clubs and players a season after achieving resounding success. Germany's worst affliction perhaps befell Nuremberg, who were relegated just a year after being crowned Bundesliga champions in 1967/68. Perhaps most importantly, the majority of the players who inspired Leipzig to that remarkable second-place finish in 2016/17 have stayed put for the current campaign. The only regular starter to leave was centre-back Martin Compper, but his departure was offset by the shrewd acquisition of Dayot Upamecano from Salzburg during the previous transfer window. Little could the 19-year-old Frenchman have imagined that within 14 months, he and 18-year-old compatriot Ibrahima Konate would both be starting in a headline-grabbing 2-1 win over Bayern. The goals against the record champions came from two familiar sources: Naby Keita and Timo Werner, who have probably been Leipzig's two best players since they joined the Bundesliga fray last term. Keita will link up with former Borussia Dortmund boss Jürgen Klopp at Liverpool this summer, but the Saxony club were determined to keep him on the books throughout 2017/18, in spite of speculation about a possible early move in January. So far the Guinea international has chipped in with eight goals and five assists in all competitions, as well as playing a key role in the heart of midfield. The turbo-charged Werner, meanwhile, has contributed 19 goals and eight assists across the board, proving that his stunning debut season with Leipzig was no fluke. Having netted 21 times last term – finishing as the Bundesliga's top-scoring German – the 22-year-old has emerged as his country's most lethal centre-forward, and looks all but guaranteed a spot in Joachim Löw's squad for the 2018 FIFA World Cup in Russia. He has certainly acquired a taste for facing foreign opposition this season: seven of his goals have come in Europe, including a first-leg brace in the superb Europa League Round of 32 victory over Italian giants Napoli. Injuries have prevented Emil Forsberg from hitting the heights of 2016/17 – when he provided a league-leading 19 assists – but, as well as helping Sweden pip Italy to a place at the World Cup, the 26-year-old midfielder has committed his long-term future to Leipzig, signing an extension until 2022. Werner, who is also linked to the club for another four years, recently insisted that he won't be going anywhere this summer despite reported interest from Atletico Madrid, Liverpool, Manchester United and Bayern. "I've got a contract until 2022 and I'm very happy in Leipzig," he told Sky Deutschland. "I'm definitely still going to be playing here next year." Leipzig have an impressive recent track record when it comes to making savvy choices in the transfer market, especially with sporting director Ralf Rangnick pulling the strings behind the scenes. Keita and Werner both made a huge impact after arriving in the summer of 2016, while Upamecano – who followed in January 2017 – has emerged as one of the world's finest young centre-backs. The latest crop aren't faring too badly either. Kevin Kampl, Jean-Kevin Augustin, Konrad Laimer and Bruma were all brought in to swell the ranks last summer, with the club preparing to tackle the added demands of European football for the very first time. Kampl has provided the perfect defensive foil for Keita, adding much-needed balance to the Leipzig midfield. The 27-year-old has plenty of Bundesliga experience under his belt, having come through the ranks at Bayer Leverkusen, and with Hasenhüttl's side enjoying more possession this term – an average of 54 per cent, third only to Bayern and Dortmund – the Slovenia international's cool head and quick thinking under pressure have been key assets. Augustin arrived after failing to break through at boyhood club Paris Saint-Germain, and the France U21 forward won't have looked back since settling in at the Red Bull Arena. With six Bundesliga goals – including three in successive games against Eintracht Frankfurt, Cologne and Dortmund – the 20-year-old is second in the club scoring charts behind Werner (11), while he also provided two assists on his home league debut against Freiburg. Laimer – voted the Austrian Bundesliga's Player of the Season in 2016/17 – was ostensibly brought in as a long-term replacement for Keita, although he found himself facing stiff competition from Diego Demme, Stefan Ilsanker and deadline-day signing Kampl for a place in midfield. Undeterred, the 20-year-old reinvented himself as a right-back, and has played 90 minutes in all but two games since the turn of the year, including the impressive victories over Schalke and Bayern. Bruma, meanwhile, announced his arrival on the Bundesliga stage in style, firing in August's goal of the month in the Matchday 2 win over Freiburg. The Guinea-Bissau-born winger has gone on to grab five goals in all competitions, as well as providing no shortage of pace and trickery down the flanks. Having made his first senior appearance for Portugal in November, the 23-year-old will now be dreaming of representing the European champions at the World Cup this summer. Leipzig certainly haven't forgotten their commitment to youth development. Konate, another summer signing, has already made 16 appearances in all competitions this season, even at the tender age of 18 – while England U21 international Ademola Lookman memorably scored just minutes into his Bundesliga debut against Borussia Mönchengladbach. In total, 16 of Leipzig's 24 first-team players are aged 25 or under. Leipzig's outstanding debut season in the Bundesliga was founded on three core pillars: aggressive high pressing, robust defending and rapid counter-attacks. They scored no fewer than 11 goals on the break in 2016/17 – more than any other top-flight team – but that figure has shrunk to just two in 2017/18, as the rest of the league have cottoned on to their tactics. Hasenhüttl has therefore been forced to innovate to keep his side in the hunt for another European finish, with largely positive results. Generally deployed in a 4-4-2 with their wing-backs high up the pitch, Leipzig continue to press opponents deep in their half, scoring 11 goals this season as a result of the other team losing the ball. They also play with a high defensive line, which makes their offside trap particularly effective, catching out opponents 94 times this season. Meanwhile, no team in the Bundesliga has won more duels than Leipzig, who average over 112 per game, and their defenders have contributed seven goals, only two fewer than Gladbach. They're also not afraid to have a pop from range, with eight strikes this season coming from outside the area. Lest we forget, Forsberg and Werner had a direct hand in 48 of Leipzig's 66 Bundesliga goals last term – an astonishing record – but for a variety of reasons the duo have been unable to hit the same heights in 2017/18. Forsberg has struggled to find his rhythm due to a series of injuries, including an abdomen problem that kept him sidelined for two months. And while Werner remains a formidable threat, the rest of the Bundesliga have learned how to better neutralise the lightning counter-attacks that were his meat and drink in that heady 2016/17 campaign. Not only are Leipzig no longer the unknown quantity who burst onto the Bundesliga scene 18 months ago, they have also played an extra 11 games this season due to their European commitments. In addition to tactical concerns, therefore, Hasenhüttl has also had to take squad rotation and player fatigue into account. It says something about the team's mental resources that they managed to beat Bayern just three days after an energy-sapping trip to Russia in the Europa League, where they secured a quarter-final place at the expense of Zenit. The club's maiden victory over Bayern was also a tactical triumph for Hasenhüttl, who opted for an unfamiliar 3-4-3 formation with Laimer and Bruma providing defensive cover from out wide. Though the switch looked to have backfired at first – as Sandro Wagner ghosted in behind Konate to head the league leaders in front – the hosts eventually made their extra man in midfield count, and came from behind to seal a memorable 2-1 win. That wasn't the first time this season that Leipzig have got the better of one of the Bundesliga's top sides. In fact, they have beaten all of the teams currently above them except for Leverkusen, who they will entertain at the Red Bull Arena on Matchday 29. In addition to their wins over Bayern, Schalke, Dortmund and Frankfurt, Die Roten Bullen thrashed French champions Monaco 4-1 in the UEFA Champions League group stage, before knocking then Serie A leaders Napoli out of the Europa League. All of which should give Hasenhüttl and his men plenty of confidence heading into the business end of the season. They are currently fourth in the Bundesliga – two points behind third-placed Dortmund, and six shy of Schalke in second – while in the Europa League quarter-finals they lead Marseille, who have failed to beat any of the other three top sides (PSG, Monaco and Lyon) in France's Ligue 1 this season. "At the start of the Rückrunde, we told the team that we wanted to get the most out of this season," Rangnick explained after the Bayern game. "If we win in Hannover, then our top-four prospects will look completely different. After all, a team who can beat Bayern are capable of beating any other opponent." Indeed. 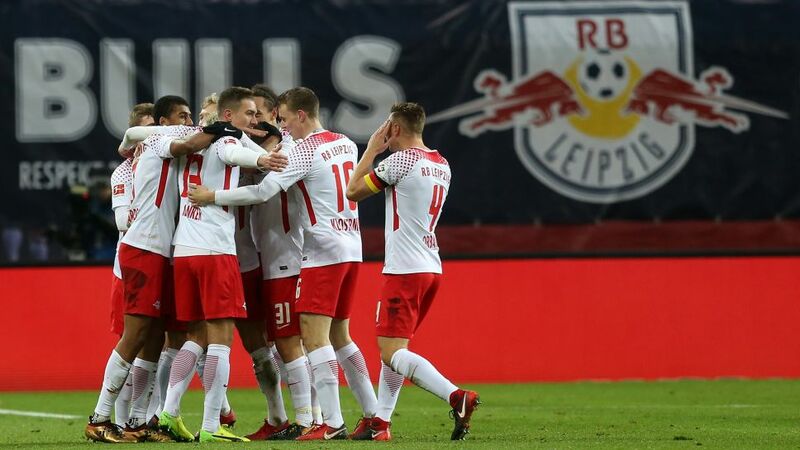 Leipzig now have six more games to become just the fourth team – after Dortmund, Cologne and Bayern back in the 1960s – to finish in the top third in their first two Bundesliga seasons. While they may be 12 points worse off than at this stage last season, the Saxony upstarts have shown that they are still a force to be reckoned with, both in Germany and on the continent. Their top-flight rivals will have to get used to the idea that RB Leipzig are here to stay.